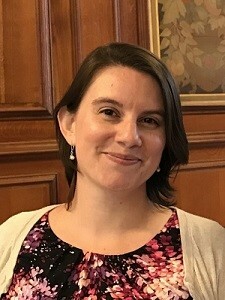 This latest installment of our series of interviews with Scholarly Commons experts and affiliates features Megan Ozeran, the Data Analytics and Visualization Resident Librarian at the Scholarly Commons.Welcome, Megan! I received a BA in Media Studies with an English minor from Pomona College (in sunny southern California). After graduating I couldn’t justify going to grad school for Cultural Studies, as much as the subject area fascinated me. The obvious career path with that degree is to become a professor, which I didn’t want to do. After some time unemployed I started a job as a worker’s compensation claims adjuster, which taught me a lot about our broken healthcare system and was generally dissatisfying. My father, a former surgeon and active in health policy, started a health information technology company so I quit insurance and started working for him. This job is where I learned about computer programming, user interface design, business intelligence, strategic planning, and attending industry conferences. After a couple of years I decided to go to library school. I enrolled at San Jose State University and started volunteering for a local independent LGBTQ library to gain real-world experience. (Check out California’s wonderful Lavender Library). After a semester I started a part time job at a small community college library and quit the health IT business. The community college library ended up being too small for me to gain as much experience as I hoped, so I took a summer internship at California State University Northridge where I explored three different aspects of digital services: the institutional repository, digitization of special collections, and electronic resources management. After receiving my MLIS this past May, I applied for a dozen jobs and eventually moved 2000 miles to be Illinois’ Data Analytics and Visualization Resident Librarian. When I was struggling to decide on a career path, I stumbled across the library sector and dug deeper. I saw that there were so many different kinds of jobs working in libraries, in large part because of social and technological shifts, and many of these jobs intrigued me. Around the time of my internship I created a personal career mission: to use current and emerging technologies to enhance access to information and resources. It’s all about harnessing the power of technology to empower people. What is your research agenda? I’m exploring the ethics of data analysis and data visualization. We have tools to analyze an astonishing amount and variety of data, but how many people critically evaluate their assumptions and decisions when performing these analyses? How many people are taught to consider ethical principles when they are taught software and algorithms? How many people consider ethical principles when they design data visualizations? Algorithms and analytics are increasingly running people’s lives, so we need to ensure that we deploy them ethically. Do you have any favorite work-related duties? I’m still very new so I’m constantly learning, which is both challenging and exciting. My favorite part has been connecting with researchers (whether students, faculty or staff) to learn about the great research projects they are doing on campus. What are some of your favorite underutilized resources that you would recommend to researchers? I’m not sure how many researchers know that the Scholarly Commons lab is a great place to come and explore your data if you’re not set on a specific analysis process. Our computers have an extensive collection of software that you can use to analyze either quantitative or qualitative data. Importantly, you can come try out software that might otherwise be very expensive. Also, I am an underutilized resource! I’m still learning, but if you have data analytics or visualization questions, stop by Scholarly Commons or shoot me an email and we can set up a time to chat. If you could recommend only one book to beginning researchers in your field, what would you recommend? Doing Data Science by Rachel Schutt and Cathy O’Neil is a great primer to all things data science (we have the ebook version in the catalog). I’m still learning myself, so I’m open to recommendations, too! This entry was posted in Interviews and tagged Data Analytics, Data Visualization by C. Berman. Bookmark the permalink.